The North Carolina Republican Party apparently wasn't impressed with Democrat vice presidential nominee Tim Kaine's lapel pin during his speech to the Democratic National Convention Wednesday night. 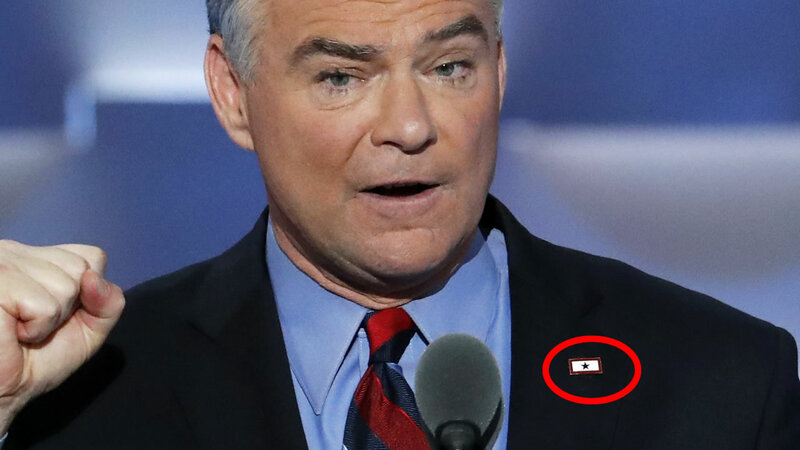 In a message on Twitter, the NC GOP wrote: "@timkaine wears a Honduras flag pin on his jacket but no American flag. Shameful." But as Ben Amey, a reporter for WNYT in Albany, New York pointed out, it wasn't the flag of Honduras, but rather the symbol recognized by the Department of Defense for Blue Star Families - the families of those who serve in the military. Kaine's son, Nat, is serving in the U.S. Marines with the 2nd Battalion, 8th Marines in eastern Europe. After Amey pointed out the gaff, the NC GOP apologized. @BenAmeyTV We appreciate you letting us know. Thanks for letting us correct our mistake. Thursday afternoon, NC GOP's Executive Director Dallas Woodhouse issued a lengthy apology on Facebook. As the Executive Director of the North Carolina Republican Party, we offer our sincere and unqualified apology for the mistake made on Twitter last night regarding Gov. Kaine's lapel pin. The tweet was wrong on the facts, wrong in tone and should not have happened. We would like to offer a sincere apology to Senator Tim Kaine, his family, and his Marine son who is honorably serving overseas. The members of the staff that were invoked are facing severe internal sanctions and mandatory retraining. When we learned of our mistake, we immediately took steps to rectify it. There are now procedural measures in place to make sure it does not happen again. While I did not see or authorize the tweet, as the Director of our organization I take full responsibility for our carelessness. Again, we are incredibly thankful for the service of Sen. Kaine's son, and all United States military, past and present, who fight for our freedom. We demand accountability from our elected officials and our government. Those standards apply do and should apply to us as well.